Social networking giant Facebook launched a new feature called ‘trending stories’, last week. This new feature by Facebook is just like the Twitter’s popular model of finding the most popular topics on the website. Being launched in India as part of a gradual roll out, trending stories feature is so far available only to a few users in the country. 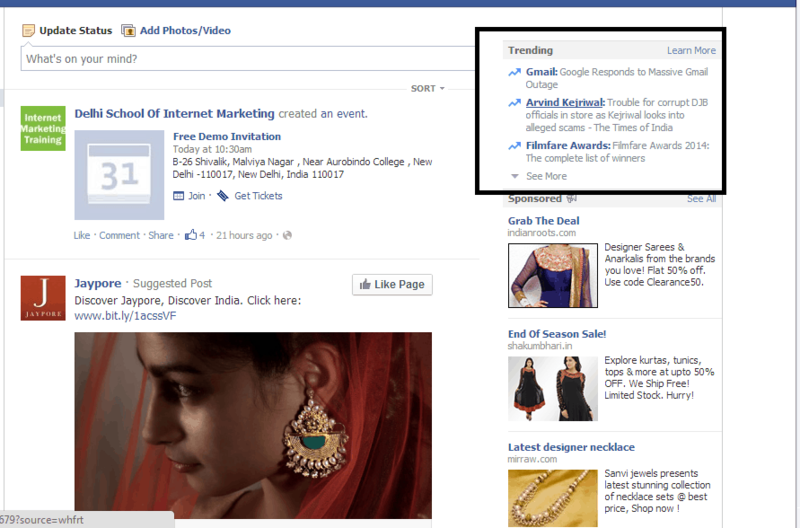 The top three trending topics on Facebook India right now are Gmail(Google responds to massive Gmail Outage), Arvind Kejriwal( Trouble for corrupt DJB officials in store as Kejriwal looks into alleged scams-The Times of India) and Filmfare Awards(film Fare awards 2014:The complete list of winners). Although much like Twitter’s trending topics, trending stories by Facebook is a bit different from that of Twitter’s as with the trending topics Facebook shows the explanation for why they are trending. However, Twitter only shows the list of popular topics on its website without presenting any details on why they are popular among users. Both websites tailor the trending topics based on locations and interests of users. Although as of now Facebook’s trending topics feature is not available for mobile users but as per the company they are testing the feature in their app for smartphones and tablet computers. Twitter app, however, shows trending topics. Facebook also launched the hashtags last year which is again one of the most popular features of Twitter.